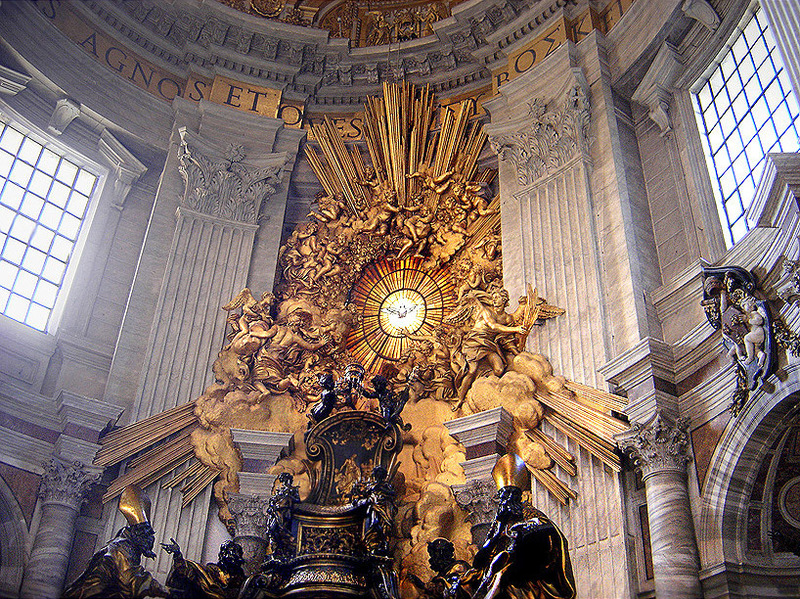 One of the most spectacular works of 17th-century Italy is Bernini’s Chair of Peter. This masterpiece employs a variety of media in a typically Baroque fashion: the cathedra and the Fathers of the Church are bronze, the Holy Spirit is alabaster, and the angels surrounding the Holy Spirit are gilded stucco. In an equally Baroque manner, it portrays dramatic motion that breaks through the barrier between art and reality and comes into our space. The Holy Spirit appears to be exploding with amazing power into St. Peter’s Basilica: the angelic figures surrounding it are blown back from the dove, even as some try to go towards it. Besides being an icon of the power of the Holy Spirit, Bernini’s sculpture is an icon of the power of beauty. In a no less spectacular fashion, beauty explodes into our lives. We see it in sunsets and snow-covered mountains, and we marvel at it in the astounding creative accomplishments of our fellow humans. Whenever we experience reality that overflows with perfection we experience “beauty”, and, confronted with it, none of us can remain indifferent. But its power can be disconcerting because beauty demands, and it exerts undeniable influence over us: it fascinates, entrances, moves, and challenges. Beauty confounds us. Why does it draw us so powerfully? In a world full of ugliness and suffering, how do we make sense of it? Dostoevsky was aware of this conundrum: interestingly, in both The Idiot and The Brothers Karamazov he refers to beauty as a “riddle.” Beauty is indeed mysterious, and its mystery affects each person differently, depending on his openness to truth. The human mind finds security in definitions, because if something can be defined, it can be controlled. In man’s understanding and knowledge of things, he finds intellectual self-assurance. However, mystery makes him nervous because before it he must admit that there is something beyond him, and this admission in turn leads to the possibility that this “something beyond”, this source of mystery, has power over him and limits him. For sensualists like Dmitri, this possibility is unbearable. In the same dialogue, he contrasts the “ideal of the Madonna” (beauty with truth) with the “ideal of Sodom” (beauty without truth), and he asserts that Sodom “for the vast majority of people…is just where beauty lies.” Dmitri is a type of all those who prefer the dazzling beauty of the world, the beauty of Sodom and Babylon, the beauty of billboards and magazines, the beauty that, according to Pope Benedict, “does not bring people out of themselves into the ecstasy of starting off towards the heights but instead immures them completely within themselves.” It’s the beauty of the fruit that seduced Eve: beauty that offers power, possession, and pleasure. But try as they might to close themselves in the “beauty of Sodom”, authentic beauty maintains its fascination and continues to bear witness to the truth, because the beauty of this world is evidence of a Great Intellect who orders all things to himself.